Requirements: VHS-format video cassette player, and IBM PC or compatible. The link between video recorders and computers is usually found in the recording of computer graphics, or the use of the VCR as a means of data storage. The Video Professor series, however, is an attempt at using the VCR as a teaching tool, and the good news is that it works. With seven tapes currently available in the series (a total of 26 will be available by January), Data Link is covering what it considers to be the ripest areas for computer education. I would guess that a check with your local computer store would show these to be the topics most requested by those seeking professional classroom instruction: Introduction to and Advanced Personal Computing; Introduction to and Advanced Lotus 1-2-3; Introduction to dBase III; and WordPerfect (two levels). The video cassettes are not meant to replace software documentation or instruction manuals, but are designed to be used as a supplement. It is, in fact, quite likely that after studying the tape, you'll find the actual documentation much easier to understand. The two cassettes on Personal Computing are aimed at the beginner. Introduction to Personal Computing starts with basics, showing you how to connect the components of a PC. This section is limited to connecting keyboard, monitor, and printer. While the camera does go inside the computer to point out the CPU and RAM chips, there is no mention of installing boards or of setting DIP switches. Presumably your computer salesperson did this for you. 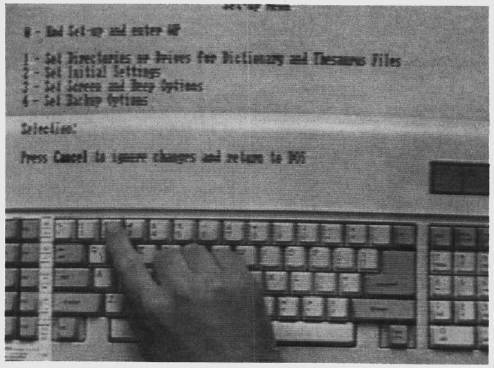 Following this, you are taught some of the basic PC-DOS commands, such as DIR, COPY, FORMAT, FORMAT/S; use of the keyboard; common errors to avoid (such as erasing your disk); and basic computer techniques (such as how to store your disk). Advanced Personal Computing may not be as advanced as some would wish—which could leave room for a third tape in this series—but it does cover more areas of PC-DOS, including copying disks; structure of directories and subdirectories; batch files and the autoexec routine; and the fundamentals of hard drive operation. Introduction to Lotus 1-2-3 includes an overview of Lotus; basic commands; explanations of cells, rows, and columns; screen scrolling; and an explanation of the menus. Subjects treated with greater depth include range commands and math functions. The WordPerfect entry consists of an introduction and a Level II cassette. In the introduction, you get an over-View of the program, loading instructions, how to make and save documents, use of the spell checker, and text manipulation. Level II carries on with search-and-replace functions, automatic backup, page layout, switching and windowing documents, and so on. In addition to the tapes previewed for this article, there is Advanced Lotus 1-2-3 and Introduction to dBase III. The tapes display solid production values. They do not look as though they were produced by ABC, but they weren't quickly produced or kludged together, either. Overall brightness, lighting, and clarity are fine. The tapes looked good on a 19-inch TV monitor and required no tracking adjustment on my VCR—which generally speaks well for the method of duplication. The instructional format of the tapes is a dialogue between the offscreen professor and an assistant named Pam. The professor states a rule, such as using the Alt key, and Pam demonstrates it by typing on the keyboard. In other instances, Pam asks questions, allowing the professor a chance to expound on a particular principle. In presenting visual examples—which is the point of having the lessons on video tape—a split-screen effect is used. Pam's hands and the keyboard are at the bottom of the screen, while a transparent overlay on top shows the effects that will occur on your monitor, This overlay is the actual monitor output and is intercut with closeups showing a particular detail on the screen or a key on the keyboard. It is a good idea and much more effective than simply photographing a monitor screen. Other visual interludes include statement and restatement of rules and principles done in animated graphics in a variety of fonts. Chapter headings and chapter reviews are also handled this way, as is an illustration of a Lotus worksheet divided by horizontal and vertical lines in an effort to better explain the concept of cells. Obviously, the graphic interludes are not only designed for visual appeal, but also are intended to help break a routine that might otherwise be monotonous. All the tapes I viewed are on T-60 cassettes. After subtracting the introduction and the ending credits, you'll have just a bit less than one hour of instruction per tape. Since students in a classroom may ask questions that do not interest you, the tapes may provide more information than a one-hour class. My one quarrel with the Video Professor series is the professor himself. He sounds like a pale imitation of Sid Caesar's professor—though not deranged and with a less pronounced accent—I see no reason at all for the intrusion of what probably was meant to be a comic European accent. That idea had its heyday long ago and it is strange to think that some producer or director considers it funny, cute, or necessary in this context. There are a few minor inconsistencies. In Introduction to Personal Computing, it is stated that drive A is usually on top, but in one of the WordPerfect tapes, drive B is on top. And while we are supposed to be seeing Pam typing the professor's commands, the hands shown are clearly male. But these are minor and in no way detract from the tapes' educational content. As to the worth of the video lessons themselves, I can see several areas where they could prove to be of high value. I think that the form of the lessons—with dialogue, questioning, statement and restatement of principles and conventions—effectively captures one tried-and-true method of teaching. Given that one can learn from the tapes, it means you also can learn at your own speed. For review, simply rewind the tape and study the idea as many times as necessary. I can also see how these tapes might be added to a growing video library of college adult education courses. Also, an enterprising computer store might use them in either a rental or loaner library, thus offering an alternative to more expensive classroom teaching. It is also possible that such a library might be used by persons considering the purchase of software. They could obtain a working overview of a program and evaluate it in terms of their particular needs and in their ability to learn.